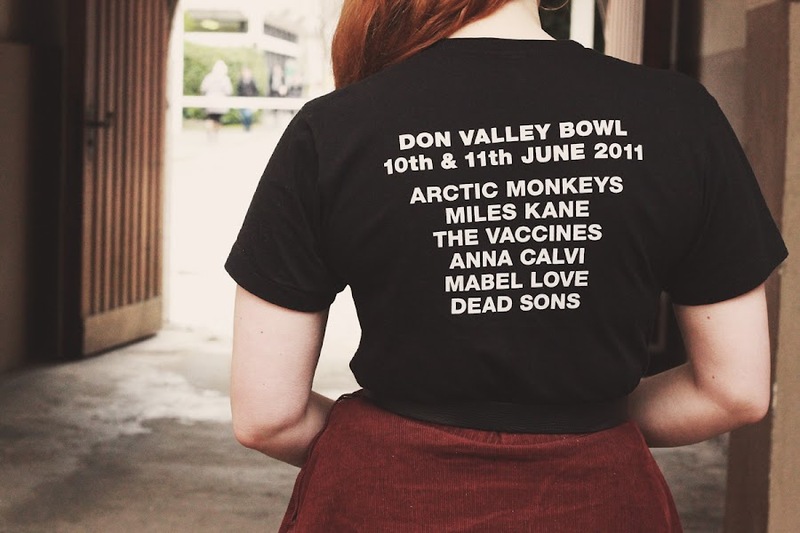 Don Valley Bowl Arctic Monkeys t-shirt: £20. The Kooples leather jacket. American Apparel corduroy circle skirt: £15, via ebay. Burgundy cut-out boots: c/o Ark. Marks and Spencer shoulder bag: £43. Rotary watch: gift. Charity shop leather belt: 20p. Charity shop faux fur scarf: £1. Superdry "electric pink" lipstick. Essie "eternal optimist" nail varnish. I would put very good money on this being my most worn outfit. As far as pay per wear goes, every item I'm wearing must be in the pennies region, and I know that the boots will soon be heading that way too. When people praise a celebrity for "recycling" clothing, I do wonder what that social media executive thinks is normal, as, come on guys, they washed it and wore it again like every normal person. Unless you're Chris Brown. I don't know what it is about this skirt which makes it so wearable, but I find that it's quite a flattering shape for my hourglass figure, although I may have to retire it soon as it's so bloody short. The leather jacket goes without saying, really. I bought it as a finishing university present, and despite it being the most expensive thing I've ever bought I don't regret it in the slightest as it's become a wardrobe staple that I grab every time when I'm rushing out to catch the u bahn to work. As for the top, you might have heard that I like this little sheffield band called the Death Ramps? I've seen them five times now, and purchased this Arctic Monkeys t-shirt (my second) at their homecoming gig a few years ago and it's lasted pretty well considering how many countries it's been to, festivals I've survived, and times it's been in the wash. Here's hoping the bobble hat I got at Earl's Court lasts as long! Need need need cut out boots! 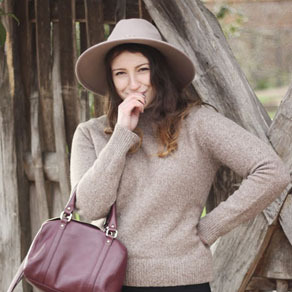 No one quite wears burgundy as well as you Rebecca! I love the feel of these photographs they look so warm and lovely. And your hair, especially in the first photo looks so old hollywood. Anna Calvi, blimey I forgot about her. I used to love her stuff! 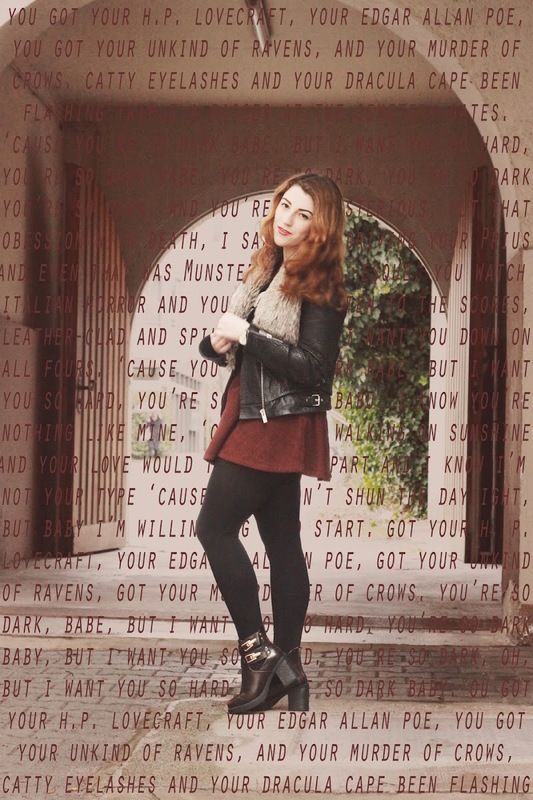 In love with this outfit, I love the Arctic Monkeys! Haha, as if anyone doesn't re-wear their clothes? Love this band tee combo! AND THOSE SHOES ARE AWESOME. Love this outfit! I love Arctic Monkeys! Lovely photos and great outfit! I was such a band t-shirt girl during my mild emo phase and I love seeing how 'grown ups' wear them now, I need to start finding ways to incorporate my music love into my outfits. Looks like you're having nice weather in Munich! Really like the way you've edited & diplayed your photos, looks wicked ! 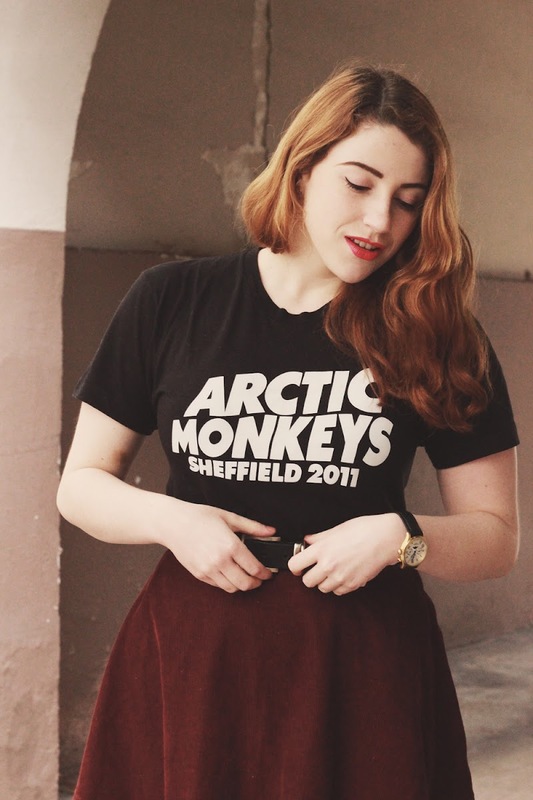 loving the Arctic Monkeys tee! The outfit is gorgeous & i'm in love with your boots! I love skater skirts as i'm an hourglass too! Those boots are really cute, I've been wondering about cut out boots but I feel as though they'll be totally impractical for things like wintery cold days and walking through puddles? Do you find you get wet feet? You wear that outfit all you want, because hell you look gorgeous in it. I have one question and one question only..